I never played the first, "Titanfall," due to not having an Xbox One, but instead owning a Playstation 4 (and a computer not nearly powerful enough to play the original game). That made me kind of sad as I heard many good things. 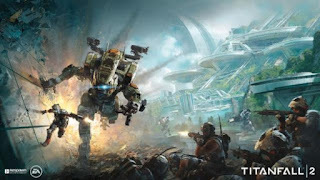 Therefore, when I heard about the tech-test for, "Titanfall 2," (they called it, "Pre-Alpha," but it worked well enough I don't know why they didn't just say, "Beta," like other free demo-weekends) I was eager to jump on the opportunity to play it. I got in a little bit of playing during the weekend of August 19th-21st and really spent a decent-chunk of time trying it out last weekend, the 26th-28th. Considering how the game was quite limited in what was available, I think it says a lot I enjoyed playing it as much as I did, and that I am really eager to jump-in again as soon as possible (the game officially comes out October 28th). The main, "Hook," to the, "Titanfall," series is the interesting mixture of play-styles the game contains and how they mesh together. You start out a match as a pilot and have the ability to move extremely fast and in a manner that I would describe as absurdly nimble--at least once you get a hang of movement. You can slide around with great speed, run on walls, and (if you pick the skill) use a grappling hook to swing around as well. It feels overwhelming at first, as players hop and skip about, but before too long I was pulling-off crazy maneuvers like the best of them. The other way of playing that makes things even more interesting is the inclusion of huge piloted mechs called, "Titans." Called down by players, you can get inside your suit of destruction and suddenly go from a small and quick-moving human to a hulking piece of machinery that doesn't gracefully run so much as stomp around and crush all below. It's all good however, because the ability of humans to dart about and fire guns that hurt titans keeps things from feeling too one-sided. Also, you can actually hop out of your titan and have it follow you around and protect you whilst you take advantage of your out-of-mech speed. I personally loved being able to have my huge robotic sidekick distract enemies and draw their fire whilst I sniped them off from a nearby hiding-place. 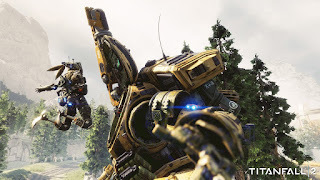 The ways you have your pilots and titans fight vary from the usual, "Stay in this place and claim the location for you team," kind of match to more interesting, "Bounty," modes that involve both teams of human players fighting against AI enemies as well as each other. Also, the full game is supposed to have single-player options, more match-types, an even greater variety of ways to deck out your pilots in useful gear, and additional titans (this test only had two to choose from). Still, even with the limited choices I had a really, really fun time--which is interesting as the internet was full of people decrying how this test was making the sequel look awful compared to the first game. Maybe the difference is how I am new to the series? After all, another person who never played the original game loved what they saw as much as I did. All-in-all, the free tech test was of high enough quality it has got me excited for the official release of, "Titanfall 2," and showed the developers how things should function when the game comes out. I'd say that means the two weekends were a success.